Misalignment is never a simple problem. There are often a wide array of issues that lead to misalignment. Use the following short list of symptoms to isolate any issues that you might be having with your industrial equipment. Be sure and review our list of the benefits of industrial alignment. Premature Machinery Failure – Bearings, seals, and couplings take excessive wear when misalignment is present. This leads to excessive wear and tear on parts, thus shortening the life of the equipment. High Temperatures at Bearings – Friction leads to heat, thus increasing the operating temperature of the machinery. Oil Leakage – Areas that are sealed will begin to suffer leakage upon misalignment, specifically the bearings. Foundation Problems – This can include broken pads or loose bolts. Excessive movement due to vibration is often the cause of foundation issues. Troublesome Machines – Similar equipment that has drastic differences in operation lifetime, output, and maintenance requirements. Once you know you have an alignment issue then you should know that there are huge benefits to getting your machinery aligned properly. Not only is your immediate issue corrected, but there are some major long-term benefits to properly aligned equipment. Increased time between equipment failures. 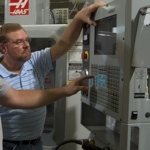 Avoid expensive repairs to critical machinery and call Schaeffer Precision Alignment today to learn how we can diagnose misaligned machines. No matter the industry, we have the tools needed to get the job done quickly to get your machinery back online fast.